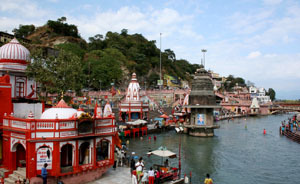 Haridwar- gateway to the four pilgrimages in the Uttarakhand region, is located on the foot hills of Shivaliks. It is on the banks of River Ganga. The Ganga leaves the mountains and enters the plains with Haridwar being the first major town on the plains. Though the Ganges does not lose its rapids completely never theless it becomes very quite and calm here. The water is clean and people prefer taking bath on the numeroushar ki pauri haridwar ghats built on the river shores. It is said that taking bath here purifies the soul and opens the way for the ultimate freedom, Nirvana. Haridwar has earned fame as being the place which has been blessed by the trinity of Lord Shiva, Vishnu and Brahma. It is also one of the major Shakti peeths. Down the ages Haridwar has purified the mind, the body and the soul. 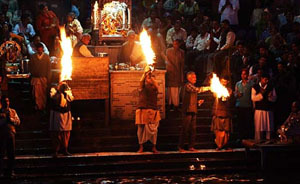 Not only in spiritual or religious terms Haridwar has come up as a major learning center for arts, science and culture. This place has maintained the Gurukul tradition of teaching. Haridwar has since ages been a source of Ayurvedic medicines and has been providing herbal remedies. Haridwar one of the first towns to be developed on Ganges is still lush and green with forest and trees. With Rajaji National Park in the vicinity Haridwar has also been the destination for the wildlife and nature lovers. mansa devi temple haridwar, The city acquires a unique charm in the evening when the ghats become breath takingly beautiful with thousands of Diyas and Marigold floating in the waters of Ganges. Haridwar culture is naturally rooted in the religious role it plays in the life of the people. The activities revolve mainly around religious events, fairs and festivals. It is natural for an otherworldly attitude to reign in the general psychology, which strongly affects even the visitors. Hotel Ganges RIVERA also arrange Bus & Taxi for a enjoyable holiday in serene surroundings of Haridwar city and provide complete tour to its customer to the nearby. It is also known as Brahmakund and it is believed to be the place where divine nectar fell from the pitcher. It is the site for the famous Kumbh Mela which is celebrated in 12 years. Large number of devotees comes especially to Haridwar to take a holy dip in the Ganga River. At twilight, when evening aarti is performed the reflection of the golden diyas that keep floating on the river offers an enchanting view of the ghat to the visitors. This sacred Ghat was built by King Vikramaditya in memory of his brother Bhatrihari, who is said to have meditated on the banks of Ganga in Haridwar. One of the most visited temples in Haridwar, Mansa Devi Mandir occupies a place on top of the Shivalik hills. The temple is dedicated to Goddess Mansa Devi, believed to fulfill the wishes of those who visit here. It is a tradition with the devotees to tie sacred threads around the tree that stands within the premises of the Mansa Devi temple. From the temple, one can have heart stirring views of the Haridwar town. Along with Chandi Devi temple and the Maya Devi temple, it completes the Vidyapeeth Triangle. The temple stands in dedication to Goddess Chandi. One of the most ancient in the country, the temple can be reached either by a ropeway ride or by undertaking a steep climb, that takes up around 45 minutes. The rituals at the temple begin as early as 4 am in the morning. Visitors are required to strictly follow the dress code before entering the premises of the Chandi Devi temple. The temple is situated towards the south of the Kankhal town. Built by Queen Dhankaur in AD 1810, the Daksha Mahadev Temple is the site where Daksha performed a yagna (a Hindu ritual to invoke gods and seek their blessings). In the Hindu mythology, Daksha Prajapati is the father of Sati, the spouse of Lord Shiva. The temple is just a few minutes drive from the railway station. Dedicated to goddess Maya Devi, the temple is a major attraction for all visitors to Haridwar.The temple is counted as one of the shaktipithas in India. According to the Hindu mythology, it is the place where the heart and navel of goddess Sati fell down, while Lord Shiva was carrying her burnt body. Numerous festivals are held at the Maya Devi temple in keeping with the customs and traditions. A modern temple, made entirely of glass pieces, Pawan Dham is now a popular tourist destination. The temple complex was constructed by the effort of Swami Vedantanand Ji Maharaj and the institute located there is growing under the leadership of Swami SahajPrakash Ji Maharaj. People from Moga in Punjab have put considerable efforts and money to erect this place. It is gifted with immaculate beauteousness covering an area of 820 square kilometers on the edge of the Doon Valley. It is situated around 10 kilometers from Haridwar. Rajaji National Park was established in 1996 and has over 23 species of mammals and 315 avifauna species. It is a safe haven for panther, bear, chital, elephant, tiger, sambar, wild boar, barking deer, python, monitor lizard etc. Elephant Safari is also available at Chilla and Dholkand.